It’s a good day to be “King!” Especially the King of Pentacles which is all about abundance, affluence, benevolence and an appreciation for the finer things in life. This card refers to an enterprising, success-oriented individual. He (or she) has a bit of the Midas touch, knows how to attract wealth and knows how to make good use of it — neither squandering it or spending it frivolously. The King in this deck is a robust and colorful King. He’s clothed in the finest royal attire. He’s vibrant, spirited and energetic: you can see that he’s got places to go. Yet he’s also very open and generous.There’s not an ounce of stinginess or pettiness about this King. If this is someone coming into your life, know that he or she is there to teach you those qualities. If this card represents you in your current capacity, don’t forget the little people — those who’ve helped you get to where you are today and have celebrated your success. But if, on the other hand, you’ve been focusing too much on what you lack or what’s been missing in your life, it’s time to rethink the messages that you’re sending out to the Universe. Remember the universal laws attraction: they’re as present as ever in this card. You ‘ll need to shift your energies to those of prosperity-consciousness and gratitude in order to fully appreciate the blessings of this King. 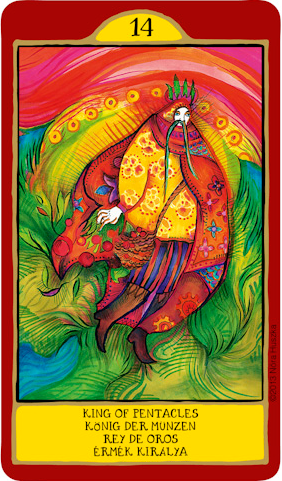 Today’s card — King of Pentacles — is part of the Gypsy Palace Tarot series, designed by Nora Huszka. The creation and marketing of this deck was the result of a successful campaign and funding through Indiegogo.com. Her beautiful deck can be purchased directly from her website, or from her Etsy storefront. Used by generous permission. Thank you Norah! Be sure to check out her Youtube channel and visit and like her Facebook fanpage too!